What do you think of when you think about the Holy Spirit? If you are like most people, the Holy Spirit is either neglected, ignored, misunderstood, or just overlooked. Theologian Arthur Pink once wrote, “It isn’t that we think the wrong thoughts about the Holy Spirit, we just never think of Him at all.” And, when we do think about Him, we are probably a little confused. Read John 14:16-31. In this passage, Jesus is speaking to his disciples. They are about to face some of the darkest days of their lives as they will witness Jesus being arrested, tried, crucified, and buried. Knowing what is ahead for the disciples, Jesus, in verse 16, offers His disciples hope in the form of a companion, the Holy Spirit. Before we go any further, one truth needs to be understood as we are introduced to the biblical description of the Holy Spirit. The Holy Spirit is not a power, He is a person—to be exact, the third person of the Godhead. He convicts of sin and reveals Jesus Christ to people (John 16:8-11). He restrains sin in this world (2 Thessalonians 2:6-7). He helps us to understand the Word of God (John 14:26). And, this is the primary truth: We have the Spirit as Jesus promised (John 16:5-7). The Holy Spirit will be our encouraging, ever present Helper. Jesus has left us here on earth to accomplish a “mission impossible”—to obey His commands, make disciples, teach the body, equip the saints for the work of the ministry, and use our spiritual gifts. Left alone, we will run and hide out in the hills, but with the Spirit’s enabling, we will be able, through Him, to succeed! The Holy Spirit will be our living, constant companion. It is not that the Holy Spirit is simply close to us, but He is actually in us. We do not pray a long time hoping He will finally listen, He is already waiting on every word. The reality is that now, at this very moment, all of the Holy Spirit is within us. 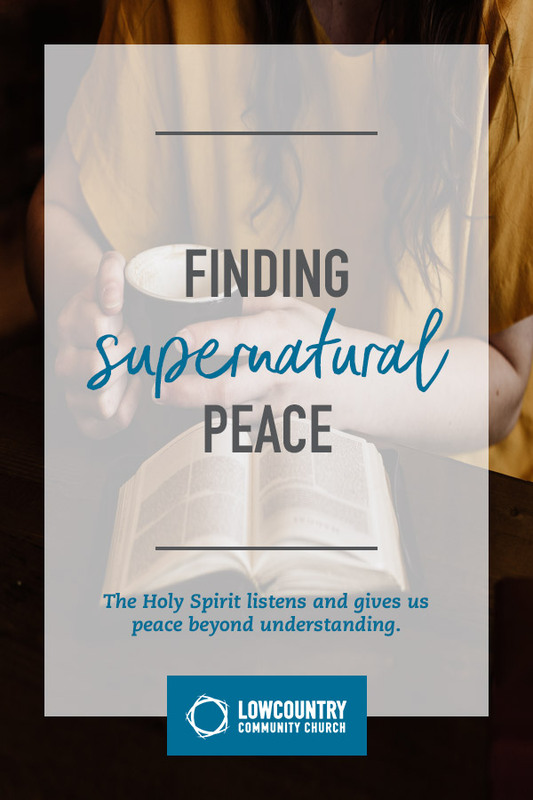 Peace is His gift to us, who enjoy a relationship with the Son as His bride, a relationship with the Father through prayer, and a relationship with the Spirit who indwells us. And this peace, which eludes the world, is our wonderful reality. Are there troubling circumstances? Yes. Are there painful trials? Yes. But this supernatural peace brings hope to our troubled hearts.